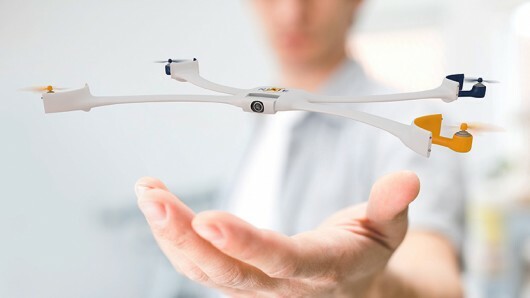 Home » Blogs » brad's blog » Rise of the selfie drones. Is tethered a good idea? Rise of the selfie drones. Is tethered a good idea? At CES, there were a couple of "selfie drones." The Nixie is designed to be worn on your wrist, taken off, thrown, and then it returns to you after taking a photo or video. There was also the Zano which is fancier and claims it will follow you around, tracking you as you mountain bike or ski to make a video of you just as you do your cool trick. This drone could not follow you as you do a sport, of course, or get above a certain height. But unlike the free designs, it would not get lost over the cliff in the winds, as I think might happen to a number of these free selfie drones. It turns out that cliffs and outlook points are a common place to want to take these photos, they are the place you really need a high view to capture you and what's below you. Secondly, with the battery on the ground, and only a short tether wire needed, you can have a much better camera as payload. Only needing a short flight time and not needing to carry the batteries means more capabilities for the drone. It's also less dangerous, and is unlikely to come under regulation because it physically can't fly beyond a certain altitude or distance from the base. It could not shoot you from water or from over the edge of the cliff as the other drones could if you were willing to risk them. My variation would probably be a niche. Most selfies are there to show off where you were, not to be top quality photos. Only more serious photographers would want one capable of hauling up a quality lens. Because mine probably wants a motor in the base to reel it back in (so you don't have to wind the cables) it might even cost more, not less. The pano mode would be very useful. In so many pano spots, the view is fantastic but is blocked by bushes and trees, and the spectacular pano shot is only available if you go up enough. For daytime a tethered drone would probably do fine. I'm still waiting on the Panono -- a ball, studded with cameras from Berlin that was funded by Kickstarter. You throw the ball up, and it figures when it is at the top of its flight and shoots the panorama all at once. Something like that could also be carried by a tethered drone, and it has the advantage of not moving between shots as a spinning drone would be at risk for. This is another thing I've wanted for a while. After my first experiments in airplane and helicopter based panoramas showed you really want to shoot everything all at once, I imagined having decent digital cameras getting cheap enough to buy 16 of them and put them in a circle. Sadly, once cameras starting doing that, there were always better cameras that I now decided I needed that were too expensive to buy for that purpose. I've been toying with your basic idea (tethered drone), but in a different context - mounted on top of an automobile, with a pretty short tether and wings rather than rotors. Airflow provides lift. The idea is to be able to see a bit further down the road - over the car directly in front of you. Unclear if you could reasonably fly high enough to see over semis. With some limited left-right movement, you could also look around, e.g., to get a sense of what's happening in the next lane. Can you detect and reel in quickly enough to avoid things when going under overpasses, signs, etc.? Dunno. Seeing over cars would be easy because you could still be under the road clearance height for that road and see them. But you would need to get too high to see over semi-trucks and RVs. However, there are detailed maps available of where all the overhead obstructions are and how high they are to the inch. You need to know speed and wind speed to know how high your drone will get but if you reel it in really low under the bridges you would be OK. I would be more worried about what happens to in the high winds when you pass a truck. It would need to be able to adjust its wings. This high view is most valuable in thick traffic in a city (25mph) but still useful on a highway but you need to trim the wings for the different speeds. Other ideas could include no wings but a fiberglass pole you can change the angle of and a camera that stays level. But both of these would end up trailing behind you. The winged camera could get far behind you and cause an issue. The poles would mostly freak people out. I had a different proposal years ago which is now cheap enough to do. require flatscreens on the back of tall vehicles showing the view ahead.. Of course, like V2V, it suffers from the fact that it only works if the vehicle ahead of you has switched.